We have this pet bullmastiff and I’m sure I don’t uniquely feel this way; like other dog owners, I feel our Simba is one of a kind. He has his ways, quirks and all that, which gives him this distinct identity and character. We named him Simba, which means “Lion”. 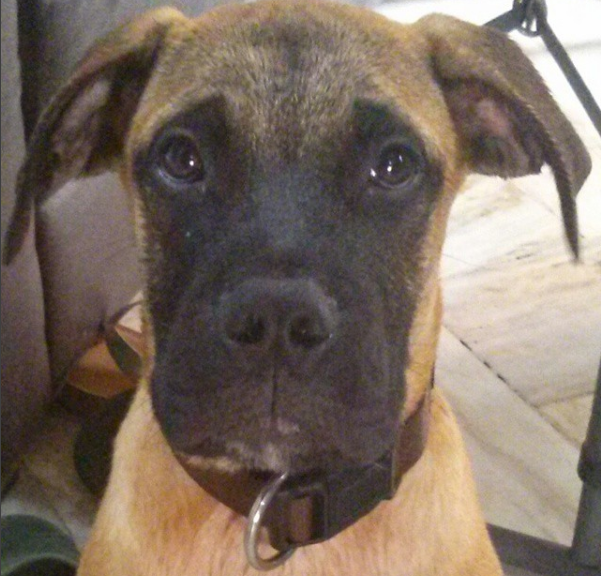 He was an ugly pup. I almost wanted to back out from purchasing him at the kennel. He didn’t look like a regular bullmastiff, no wrinkles, no large frame. He was thin, lean, and all straight and flat. 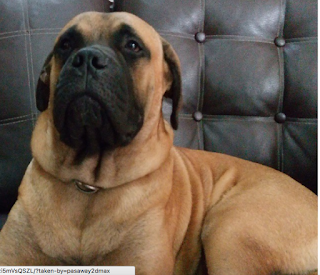 Characteristic of normal Bullmastiffs, he was guarded at first, a bit aloof and doubtful of people and surroundings. It took him over two months to feel more at ease in our home, to freely walk around without being easily spooked, and to trustingly accept our spontaneous pats on his forehead. He wasn’t affectionate for a long time. You would have to initiate physical contact. Many times when we called, he wouldn’t come. And when we approached him, he would move somewhere else. The Bullmastiff is one dog breed you would love taking care of. Although that didn’t seem so with us at the beginning, forward three years of having him in our family- we’ve grown to really love him. 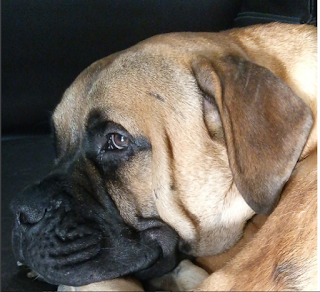 This Bullmastiff must not like staying outside during the night away from us, because he would start calling out to us early the next day. Before the sun went up, he would start with his incessant barking, that is, until we opened the door for him. He would even do his “Simba” version of a knock, that is, to strongly pound his paws on the door until it opened up. Some may say that is bad training or he is rotten spoiled. We understand however that he just wants to be with us. Because soon as we open the door for him, he will just quietly lounge inside and cuddle up to us. And he wouldn’t be noisy. He would never pester anyone. If he sees us eating, he will just stay nearby, look longingly, extend his paw to shake our hands, and wait for his treat. 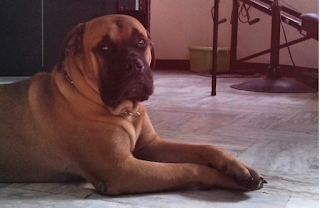 Our bullmastiff is also very smart. Early on, he figured out how to unlatch the dog barrier and let himself into the living area. Whenever he did something naughty, he knew he’d be grounded for it and so he would voluntarily enter the dog cage and stay there, all without being told. He is still also a pup at heart. He’s very playful and easy to please and amuse. He loves water, he always washes his face everytime he drinks water. Whenever we do outside cleaning, he would interrupt us, face the water hose and ask for a quick shower. He also loves to eat. He can munch on food all day if you don’t control him. And he’s just crazy about raw eggs and raw chicken necks. 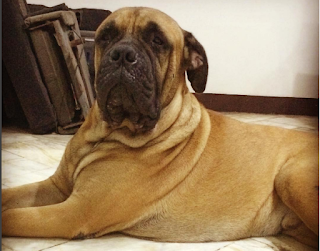 Simba, the wrinkly bullmastiff has grown to be the sweetest, most attached, most physically affectionate, and most protective pet. His alertness and watchfulness are put to great use when strangers lurk and make sounds outside. Unexpected visitors are warned beforehand and so no one enters the premises without being escorted in. He can have prolonged bleeding. He has problems with blood clotting. Tick bites are more bloody & take a bit longer to stop. Wounds take longer to heal and dry up.